If you are looking for office recycling bins, look no further than Après Furniture. Thanks to over two decades worth of industry knowledge and experience, we are able to offer a varied selection of office recycling bins, providing the opportunity to take part in green recycling, food waste recycling, plastic bottle recycling as well as paper recycling. We supply modular office bins which are configurable so that you can set up your own custom recycling receptacles and separate waste into different compartments in preparation for the next stage in the waste recycling process. Linkable recycle bins save space and are available with labelling to make office recycling easy for everyone to get involved with. There is no doubt that office recycling has become an important part of the way nearly all offices operate nowadays. Sustainability and recycling compliance is often written into corporate responsibility policies and understandably so. However, office recycling bins sometimes do not integrate aesthetically with existing office interiors, jarring with the décor and becoming a focal point for the wrong reasons – an eyesore within otherwise attractive modern office spaces. Bisley LateralFile™ RecycleSpace Cupboards were designed to solve this problem. Offering 3 x 50 litre recycling bins concealed within a single LateralFile™ cupboard, the result is a clean and tidy piece of office furniture. 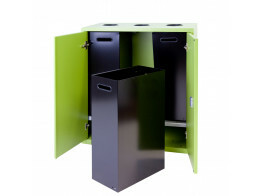 Available in a range of colours, this is the perfect solution to unsightly office recycling bins! Demonstrate your company’s commitment to recycling and responsible waste management with recycling container solutions from Après Furniture. 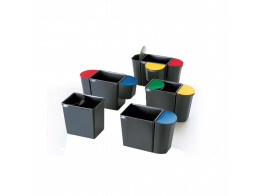 Tribu Waste Paper Bin comprises a main waste bin (26 litres) and two smaller waste bins (5 and 9 litres). Primo Recycling Unit will allow you to recycle at the workplace while keeping the design. 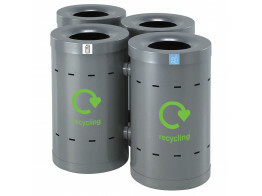 Bros Linkable Recycling Bins will suit either in the office environment or public areas. 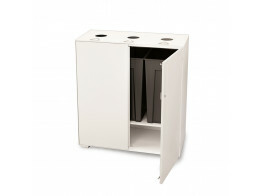 Bisley RecycleSpace series offers 3 x 50 litre recycle bins concealed within a LateralFile Cupboard.